Never mind name fame. This Rinker is a solid offering from an experienced builder, for a good price. 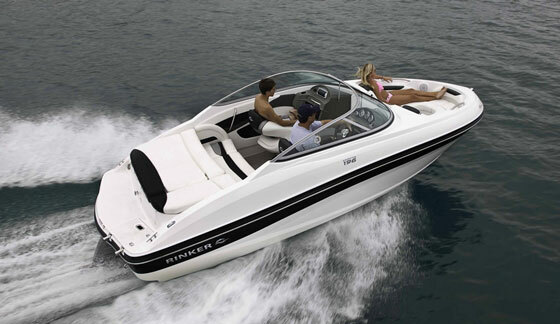 Although Rinker isn’t necessarily a household name like, say, Sea Ray or Bayliner, don’t let a lack of name recognition fool you. 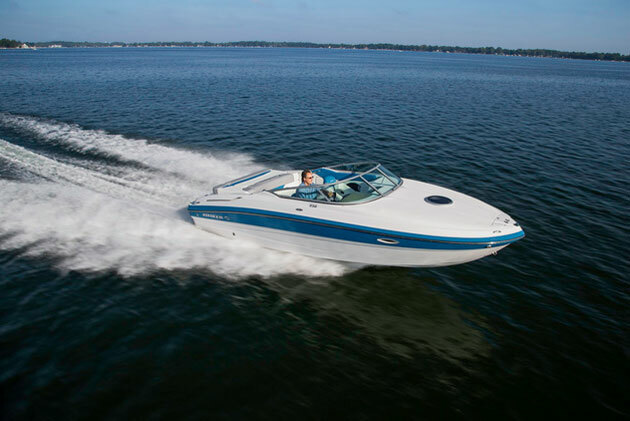 Rinker has been building boats since 1945, and when you visit the company’s plant in Syracuse, Indiana, or attend its dealer meetings year after year—as do many marine journalists—you get a feeling of consistency. 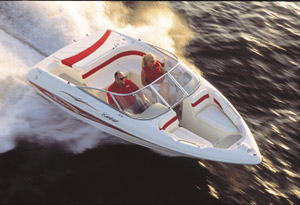 Rinker has been building solid boats for years. 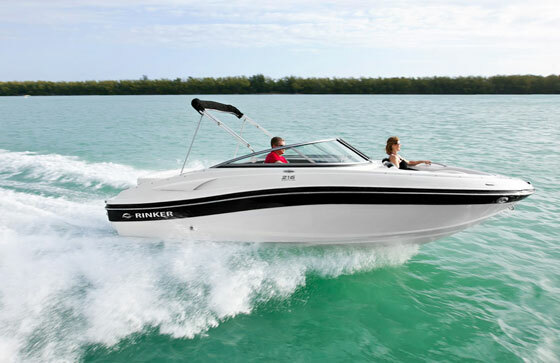 Standard power on the Rinker Captiva 216 BR is a 260-hp MerCruiser 5.0-liter V8 with an Alpha One drive. Choose a V6 engine and there’s more to spend on other options. 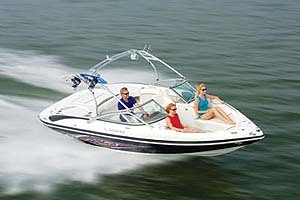 So you might not get a knowing nod of approval from someone when you buy a Rinker. That doesn’t matter. Here’s what does matter: The price you pay is for the boat, not the name. 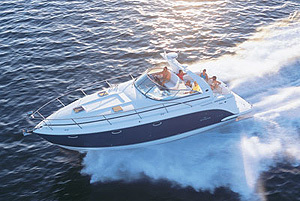 Take Rinker’s Captiva 216 BR. 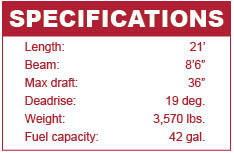 In standard trim, with a 260-hp MerCruiser 5.0-liter V8 and Alpha One drive, the Captiva 216 BR stickers for $43,167. 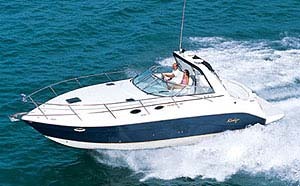 A comparable Sea Ray, the 210 SLX with the same engine and drive, lists for $49,356. That’s a difference worth noting -- but what do you get for your money? For starters, you get the aforementioned V8. If you want to spend less and don’t mind a smaller engine, you can get a 220-horsepower MerCruiser 4.3-liter V6 and Alpha drive for $37,866. With either power choice, you get a smartly conceived little runabout. For example, the bow features a standard anchor locker with retainers for a Danforth-style anchor, and a dedicated cleat. There’s also plenty of stowage under the removable lounges and a built-in cooler under the forward cushion. What’s neat is that it has sizeable compartments accessible through the backrests -- a great use of the space, particularly in front of the driver, that sometimes goes to waste. Under the windshield, the 216 comes with a bi-folding wind dam and a cavernous in-sole ski locker large enough to accommodate a wakeboard with the bindings attached. Supported on a gas strut, the lid can be raised by driver or observer with or without the wind dam locked in place. 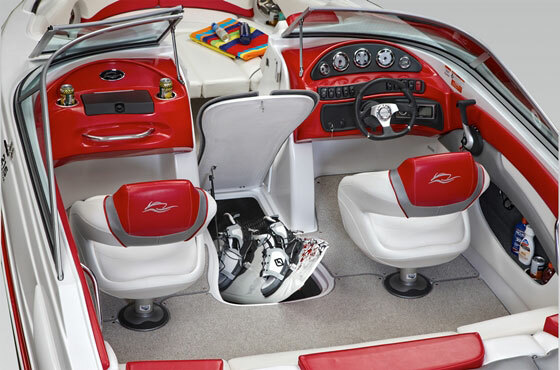 There’s a locker under the cockpit sole big enough to handle a fully rigged wakeboard. Note the gaskets and gas-lift. The helm is straightforward, with all necessary gauges—including a standard depthfinder (yeah! Read my recent post on Boat Equipment: What Ought to be Standard) and rocker switches arranged on simple black matte-finished appliqués. No woodgrain here, which is another plus, as is the standard Isotta steering wheel with the flat bottom. Inside the cockpit, standard snap-on Berber carpeting—yes, standard—covers the cockpit sole. The rear bench seat is fitted with a removable cooler and wet storage. Driver and observer seats also feature flip-up bolsters, which are almost de rigueur in today’s market, as is a starboard-side walk-through to the swim platform. However, Rinker took the walk-through a couple of steps farther. First, it hinged the filler cushion on the inside, so when you’re finished boarding or swimming, it flips down to form a full sun pad. Second, it fitted the walk-through with an enormous stowage compartment beneath. There’s another hinged pad and stowage compartment to port. Pretty neat. Once you get to the swim platform, you find that it’s nice and wide and uncluttered. The telescoping swim ladder is concealed in its own locker, the lid of which is fitted with a grab handle to help swimmers climb back on board. There are plenty of options available. If you saved the six grand by choosing the V6, maybe you can check a few boxes and tailor the 216 a bit more to your tastes and needs. 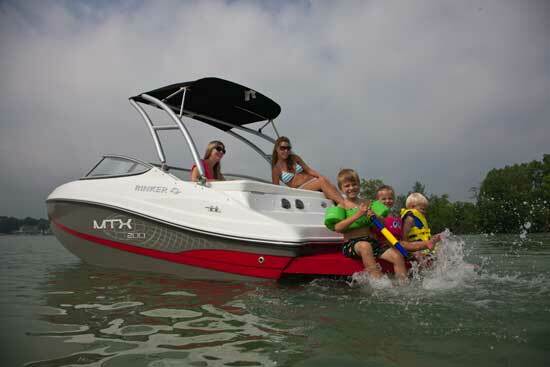 Were it ours to outfit, we’d go with the full canvas enclosure package for $1,186 and the wakeboard tower for $3,971. Even then, you’re still money ahead of the base model with a V8. However you choose to equip the Captiva 216 BR, be assured that the money you’re spending is on hard assets, not intangibles like name recognition. Take the difference and spend it on a boating vacation. This summer and next.